Mt. 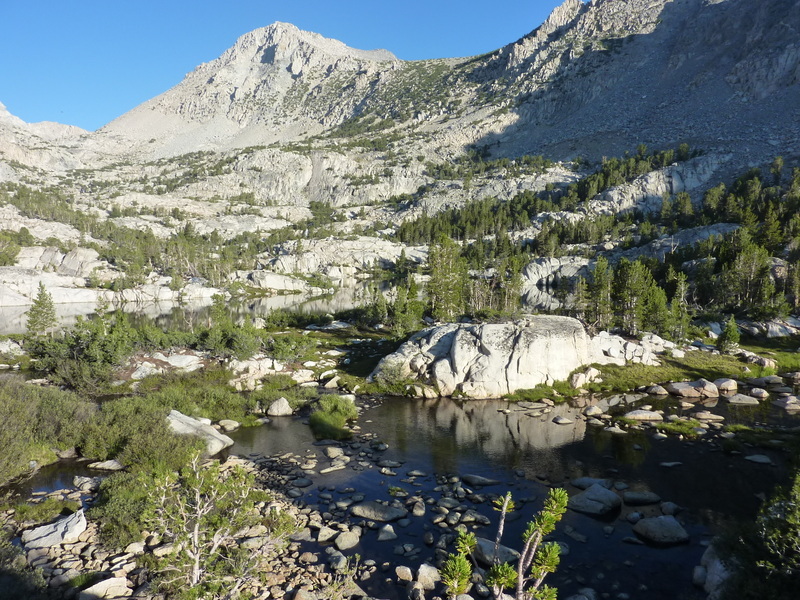 George Davis is located in the John Muir Wilderness above North Lake, dividing the Piute Pass Trail to the north from the Wonder Lakes area to the south. A well-meaning group of folks visited the summit in 2014, dubbing it "Mt. Thoreau" to go with Mt. Emerson on the north side of Piute Canyon. They created a website, made an unsuccessful bid to get the name officially adopted and have now written a book about it. I don't mind folks wanting to name peaks in the Sierra and have far less qualms about it than the USGS and BGN, but like the ill-fated effort to name Brower Palisade, I don't like it when someone tries to rename a mountain with an existing name. Why not find one of the hundreds of unnamed ones to attach a name to? Perhaps they didn't realize that Peak 12,691ft already had an unnofficial name, proposed by Chester Versteeg in 1940 for the prominent High Sierra cartographer, though they quote information from RJ Secor's book (which is where this comes from) elsewhere. I felt that Sierra history needs to be preserved, not changed, and put the peak on this year's Challenge so that the original name can be reclaimed. As one of the easiest peaks ever assigned to the Challenge, it was no surprise that we had more than 20 folks at the North Lake TH for a 7a start. Most of the first hour was spent plying the Lamarck Lakes Trail to Lower Lamarck Lake, by which time our large party had split up into a number of much smaller groups. I found myself alone when I turned off the trail near the lake's outlet to follow a use trail around its north side. A lone fisherman, bundled up from the cold, was dutifully casting his line into the calm waters as I went by. I met up with Tom B and a few others as we wandered through the woods and past unnamed lakes in the lower half of Wonder Lakes. Eventually the woods and lakes peter out, leaving more open terrain, green alpine meadows for a while, then a slog up steep sand, talus and rock. The gradient eases as one reaches the ridgeline where it becomes an easier slog to the summit. It took only 2.5hrs to get ten of us to the summit. It was a very fine morning and quite pleasant at the top, leaving no one in a hurry to get back. Well, almost no one. Zach, Rob and Clement raced off after we took a first group photo, Zach and Rob were preserving their close race for the Yellow Jersey and would finish together, but it was Clement who took the better cross-country line back to the trail to take the stage win 10min ahead of the other two. The rest of us were content to sit about the summit snacking and watching the remaining participants trickling in to the summit over the next hour. We found the register left by the Thoreau fans four years earlier, adding a large page of entries from the Challenge participants. I then wrote in "George Davis" in places where "Thoreau" had been written, a petty bit of indignation on my part, to be sure. An hour later we took a second group photo with 15 folks, four having left already (Kristine had also decided to head back early). We all then began the sandy descent back down to Wonder Lakes. Sean Reedy was the first of what became a wave of swims in several of the lakes found here. I may have been the only one that skipped the swim, as I kept heading back down. There was a minor disturbance in the Force when I unexpectedly came upon Evan and my brother, the latter buck naked, standing in about a foot of water. I thought they had planned to fish today, but evidently there were other activities on the menu as well. I didn't stop to find out what the story was, but continued to the trail on my own and returning to the TH by 11:30a. I've enjoyed your reports for many years now and have used them sometimes to help plan backpacking trips. This entry above shows a lack of understanding of our "Mount Thoreau" project that I want to clear up. If you had read our posts on summitpost or climber.org you would have known that we were aware that there had been a proposed name for peak 12,691 of "Mount Davis," but we wanted to revise that to "Mount Thoreau" because of its location across from Mount Emerson, and the fact that there is no name in the Sierra commemorating Thoreau, a crucial influence on Muir and therefore a very important person in the actor network that created the fine wilderness area that you have so much fun in. And with all due respect to Versteeg, a great climber, George Davis the wonderful USGS mapper and explorer already has a really fine official memorial in the Davis Lakes. So our name for peak 12,691 is better for that peak. If you would read our book you would learn more about it-- try it-- NAMING MT. THOREAU. Buying a copy will help the Mono Lake Committee as all proceeds go to them, they being its publisher. So yes, defacing the summit register we left was indeed "a petty piece of indignation." I hope you will recant, reclimb, and erase your bad work! Or at least open your mind to the idea that names of peaks often change, and this "Mount Thoreau" is better than "Mount Davis" which after all is a failed name barely noted in Secor and never used elsewhere. It's "Mount Thoreau" now, get used to it. Also, we did not make any attempt to make the name official, nor did we create a website. Don't know where you got that misinformation, but maybe you can revise your account above to get your facts straight. If you want to interpolate this comment from me into your account, that would be great. Thanks again for your amazing adventures and your meticulous, useful, and entertaining accounts of them. I hope you will take this in, and I'd be happy to talk to you further about it. I think your regard for Sierra history is admirable, but there's a lot of Sierra history describing slippage among peak names in the early years, and a casual suggestion by Versteeg about Peak 12,691 that no one ever took up, and was merely listed by Secor in his work as a completist, is not really a naming, just a suggestion. It was a failed naming attempt. Our group is going to be working from now on to make the name "Mount Thoreau" stick. Already it's on Google Earth as such, and many other mapping sites, and we'll continue that work. So we are not a misguided group, as you put it, although we are well-meaning, as you also wrote. In that spirit I hope you will reconsider, because your website is a major repository of Sierra lore, and it does our cause no good for you to be hauling up some failed naming effort from the past to challenge our inspired idea. Our book was featured at the recent biannual meeting of the Mono Lake Committee in Lee Vining - I wish you had been there, and can send you a recording of the meeting if you would like, so you can learn more. Gary Snyder led the performance by the Mount Thoreau collective as he always has, and Tom Killion showed the membership (the population of Lee Vining doubled for the meeting) his beautiful woodblock print of Mount Thoreau, and the rest of us gave short talks about the project and what it has meant to us, and we hope to all. It was a real Sierra moment, in the spirit of Sierra Club nights out around the fire when Cedric Wright would play violin while Brower and Clyde listened. I might have more sympathy for the idea of a memorial to George Davis if it weren't for the fact that the Davis Lakes are a superb memorial already. You've been by them and looked down on them many times, you know what I mean. So his memory for Sierra people who care about history and names and beauty is already well taken care of. Meanwhile, there is nothing in the Sierra to memorialize Thoreau, even though if not for Thoreau, Muir would not have been the person he was, and it took everything that happened to get the Sierras saved the way they are, including Muir as the charismatic leader of the effort. So it is more than appropriate that Thoreau be memorialized in the Sierra, and after careful consideration, Peak 12,691 was clearly the best choice. Now when people hike up Piute Pass they go between Emerson and Thoreau, like people go between Scylla and Charybdis when going down the Enchanted Gorge - and Emerson and Thoreau were crucial in creating a new American wilderness ethos, so it is very fitting and beautiful that this new mental construct exists. Hope you will agree and change your mind and join our cause. If you care to learn more, [please see] my original article about our effort. I wish I had thought to write you a letter of appreciation in years past, so that this wasn't our first communication. I have often used your reports, as I said, to help us to plan backpacking trips, and I've read many more just for enjoyment. Your project of climbing all those peaks within 24 hours of leaving the trailhead is kind of crazy, but but also interesting, and we are tolerant of other people's ways of appreciating the Sierras, as I hope you are too. Yours resembles ultra-marathoning that uses the Sierra as its playground, and that's great - also very impressive just as a feat of route finding and walking, as well as scrambling and climbing. A test of endurance. As for us, me and my hiking friends have been backpacking in the Sierra for 45 years now, and have put in a few thousand miles and spent now an aggregate of about two years of our lives sleeping up there in the high basins. It's holy ground to us as well as the greatest playground imaginable. I'll be writing a book about that in the next few years, and look forward to that project with immense enthusiasm. The Sierras take up a huge place in the lives of all those who live the range. Thoreau has to be part of that. I hope you will adapt to our great idea and join in by supporting it, or at least understanding it - and certainly not condescending to us or defacing our work.